Fields of Blood: KOW - The "Corkscrew"
Yesterday I had a couple of games down at the Club with Josh, a new member. Josh played in WSS-Summer a couple of weeks ago and is a recent adherent to the game. He was using his Orcs and I was playing with my Herd. We played Pillage first and then had a game of Loot. It was in that second game that I got "corkscrewed". A lot of experienced players will know the "corkscrew" and Nick William from the Rules Committee dedicated a couple of posts on his blog a few months ago to describing it in detail. I recently touched on it on this site when I was describing the "50mm rule" for allowable pivots. 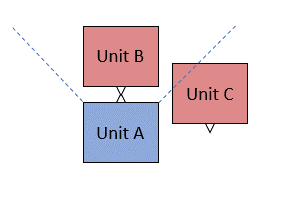 Essentially it occurs when a unit that is facing off with a unit turns and hits another unit (usually in the flank). At that point there is usually a smug look of self-satisfaction on the face of the player who pulled it off (basing it on my own use) and a deflated look of "That can't be right!" and "Crap, I've fallen for it again" on that of the charged player. 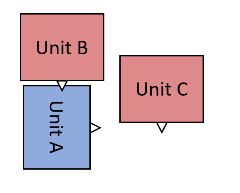 In this case Unit A was a Giant (50mm square), Unit B was a Chimera (50mm square) and Unit C was a Lycan Horde (120mm x 80mm). The only real dimension of relevance in this instance is that of the Giant. It is a straight line to its target (there are exceptions for units with Nimble). So here the Giant has turned and can now move directly onto the flank of the Lycan Horde while the Chimera breathes a sigh of relief (actually in this case he was charged in the flank by orclings - so not so much relief after all). As I mentioned things can get even more tricky if Unit A has Nimble and can make two Pivots. The key to protecting against it is to ensure that your units aren't staggered. Therefore you should always considered your moves after combat to make sure you don't expose your flanks. Square units are very good at doing it but remember the 50mm rule - any unit that has width no more than 50mm greater than its depth can complete the Pivot given the usual 1" gap. Good on Josh for catching me out...Me? I spent the afternoon in the mirror room taking a long hard look at myself! Oh dear Pete, did you get screwed?